Mr. Jean-Claude Juncker, President of the European Commission, addressed the EU-China Business Summit in French. He mentioned that he came to China for the first time 20 years ago in 1996 and immediately fell in love with the country. He said he was – then as now – impressed by China’s history and civilization. Together, China and Europe, can raise the prosperity and well-being of the people of China and the peoples of Europe, and strengthen the stability of the world. Many wonder what road Europe will take after the decision of the British people to leave the European Union, Juncker told his audience, emphasizing that Europe – even the Europe of 27 member states – is and would remain the second largest economic zone in the world. Commission President Juncker reviewed the past four decades of relations between the European Union and China and the progress achieved. The European market has made it possible to speed up the Chinese economic miracle through exports, Juncker said, and it allowed millions of people to rise out of poverty. We are at the dawn of a new era in our bilateral relations, and its success will depend on how we tackle the complex process of transformation together, Juncker said. 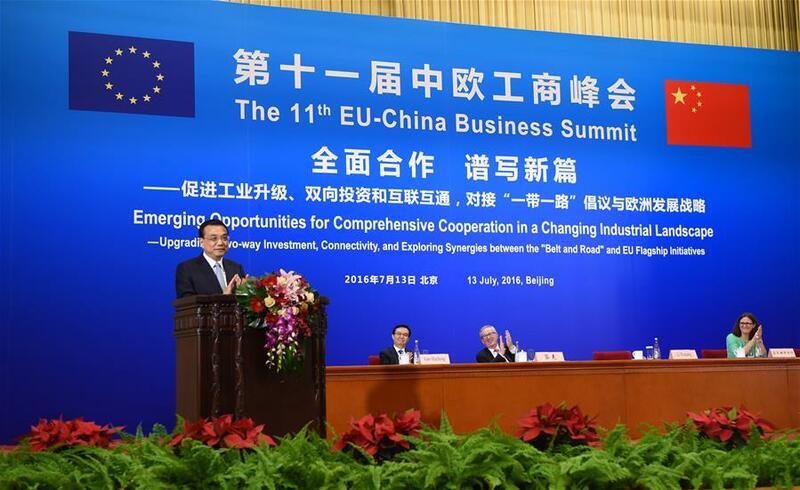 Premier Li Keqiang urged the European Union to keep its commitment under the World Trade Organization (WTO) framework and stop imposing unfair anti-dumping investigations against Chinese exporters. Li called on the EU to follow Article 15 of the Accession Protocol of China’s entry into the WTO, which says all WTO members should stop following subrogate country measures in anti-dumping cases against China by December 11, 2016. Under such measures, importers can use production costs in a third country to define the value of exports from a non-market economy when calculating the dumping margin. Many anti-dumping investigations on Chinese exports were conducted under this mechanism despite China having successfully built a market economy after decades of reform and opening-up, Xinhua reported. 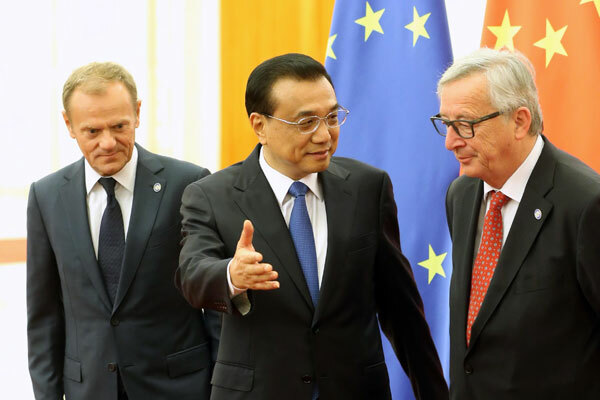 Li co-chaired the 18th China-EU Leaders’ Meeting with European Council President Donald Tusk and European Commission President Jean-Claude Juncker on July 12 in Beijing. Li said that China firmly supports Europe’s integration process and wants to see a stable, flourishing and strong EU. China is willing to work with the EU to reach a high-level investment agreement and initiate feasibility research of a free trade zone (FTZ), both aiming to boost liberalization and facilitation of trade and investment, Li said. Li called on both sides to enhance cooperation in infrastructure construction, 5G, network security, maritime sectors and people-to-people exchanges. The Premier also called for further cooperation with Central, East and South Europe to enhance balanced development of the continent. He said China is willing to cooperate in fields such as infrastructure, third-party markets, innovation and research, and cybersecurity. Both sides signed an agreement on energy cooperation at the Great Hall of the People after a meeting lasting an hour and a half. Last year, China and the EU decided to link up China’s Belt and Road Initiative with the EU’s investment plan, as well as establish a China-EU mutual investment fund and a China-EU connectivity platform. Mr. Donald Tusk, President of the European Council, addressed the EU-China Summit, saying he was pleased to meet Chinese Premier Li Keqiang in Beijing. The Summit gave Chinese and European leaders the opportunity to demonstrate the strength of our Strategic Partnership in these testing times, he said. President Tusk said that the European Union welcomes China’s Presidency of the G20 this year in Hangzhou. “As two of the largest economies in the world, the EU and China have an important stake, as well as responsibility, in ensuring the growth and stability of the global economy,” and “the European Union looks forward to closely work with China to resolve international conflicts and address foreign policy priorities,” Tusk said. He emphasized that global issues, like migration, international development assistance, the environment and fighting climate change, can only be resolved through a global response, for which a collaborative EU-China relationship is crucial. Tusk said that the protection of the rule-based international order may be the biggest challenge ahead of us. Globalization brings many benefits to our nations, but more and more people feel that it is happening without rules, the President of the European Council said. If we let these feelings grow, the first victims will be the Chinese and European economies, not to mention people. “Today’s summit should send a message to our people and to the rest of the world of our joint commitment to our Strategic Partnership,” Donald Tusk said. In a second speech after the conclusion of the 18th summit between the European Union and China, President Tusk said both parties had rich and sometimes very candid discussions on all dimensions of their relations, adding that talks with President Xi and Premier Li were “fruitful and conclusive”, moving the strategic partnership between the European Union and China forward. Ahead of the September G20 summit in China, both parties agreed to tackle the migration crisis at the global level. They also agreed to have another round of dialogue between the EU and China about human rights this year in Brussels. Mr. Joerg Wuttke, President of the EU-China Chamber of Commerce in China addressed the Summit. “Sixteen years ago the founders of the European Chamber brought more than just an additional business organization to China. They also brought a new commitment to reform, conceived in the belief that China can do better, and dedicated to the proposition that fair trade and a level playing field for investment benefits China first and foremost. They also understood that a China that reforms is of great benefit to EU business”, he said. He added that both China and Europe are engaged in challenging times. “We meet today, while the global economy is fragile, the ugly face of protectionism is rearing its head and populism challenges growth as well as the livelihoods of many of our citizens. We have come to pledge new ideas, formulate new solutions and to express our confidence in the ability of our leaders to steer our regions through troubled waters,” the President of the EU-China Chamber of Commerce in China said. “The members of the European Chamber are known for doing diligent work with our 400-page Position Paper, not mincing words while discussing overcapacity and remaining confident in China’s ability to reform as they meet dignitaries in Beijing, as well as in the other eight cities where our chapters maintain offices,” Wuttke said. “The EU and China, each struggling with the pain of transition, are too big to fail in their efforts. It simply isn’t an option,” the EUCCC President concluded, saying the 1,600 members of the European Chamber in China are able, willing and committed to do their bit, small as it might be.